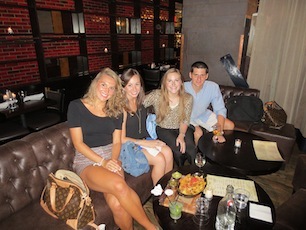 The chapter welcomed current students and recent grads to New York City. NEW YORK -- Alabama alumni present and future met in what has become an annual gathering for the Greater New York Chapter as members spent time with interns and new graduates at Ainsworth Park for the UANYC Summer Mixer. "It was a great turnout!" said chapter member Rebecca Mummert, who was recently named Region 1 Vice President of the University's National Alumni Association. "The students were impressive and so complimentary of the event." Approximately 40 students and new grads joined a dozen Alabama alumni for the chapter's summer happy hour to officially welcome current students who are completing internships in the New York City area this summer, new alums who have recently relocated to the area and parents, family members and friends who are connected to recent graduates or current students. "The students were all really interesting to talk to and each person I spoke with expressed gratitude to the chapter for arranging an event and making them feel welcome," said chapter member Ann Taylor Shaw, who just completed her three-year term as NAA Region 1 Vice President. "The interns seemed eager to move back to the area after graduation and the new grads were happy to meet other grads in the city. The new grads are definitely ready to experience football season at The Ainsworth this fall."